Can you imagine how many people on earth are homeless and how difficult it is for them to live a homeless life? Well, it’s very tough even to have an idea about their sufferings, while staying inside a house and relaxing on our cozy sofa. But what no one could notice, that caught the attention of Gregory Kloehn. 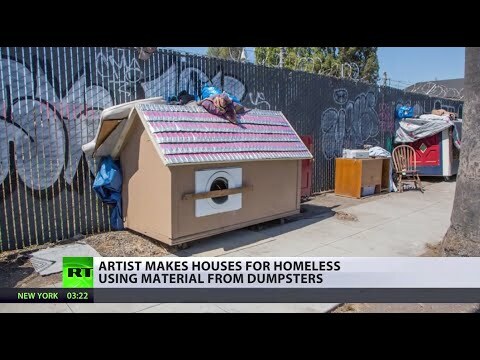 Gregory, an artist from Oakland, California is ingeniously battling with homelessness by building small houses for the homeless people. Gregory Kloehn builds small houses out of the materials he finds on the streets. Gregory uses pallets, bed boards, washing machine doors and many other bizarre objects to build the houses. The idea to use these materials came to his mind when he noticed that homeless people built shelters from whatever they find on the street. Each house costs Gregory around 40 dollars and it takes him about a week to finish a house, depending on the style. For the homeless people, houses made by Gregory Kloehn are comfortable enough to lie down in a warmer place than a cardboard box; but most importantly it makes them happy. They even like to decorate them by themselves. Currently there are about 25 people using such houses and Gregory Kloehn is putting all his efforts to create more.